Live Conference PRO™ is an enterprise-class, web meeting service designed to allow the non-technical person to show a YouTube video or PowerPoint (without requiring bandwidth-heavy screen sharing) as well as see, talk, text chat and share files with audiences. Tested to sustain up to approximately 10,000 live attendees. Also includes a user-friendly Video Postcard solution. Platform is available as a true private label/white label, (not a re-seller) service. Includes desktop meeting room access as well as iOS and Android apps. Currently available in 10 languages, however, any language can be added upon request. This SAAS was optimized for Network Marketing organizations to offer web meeting rooms under its brand to distributor members. A core benefit of this platform is that it allows the company to populate its branded meeting rooms with company-approved videos, slide decks and other files. This centralized presentation repository allows the company to keep all distributor member meeting rooms up-to-date with the latest, approved versions of its sales and compensation materials. The global web conferencing market, which includes SAAS and on-premise, grew at a healthy 9.8% in 2015 to reach $2.41 billion. The overall market is seeing accelerated demand driven by simplification, lower-prices, and migration from stand-alone audio to web and video conferencing. Web conferencing software and services are forecast to reach $3.6 billion in 2020. Demand is growing rapidly with several vendors reporting greater than 20% growth in usage. The demand for web meeting services grows daily. Most people fear standing in front of people to give a presentation but are completely comfortable and confident in an online meeting environment. Whether you’re a start-up or a fortune 500 corporation, you can own a robust, easy-to-use, web meeting private label solution, fully branded for your business. Historically, client attrition rates are extremely low because the service bundles convenient features for their business which they don’t want to give up. For example, clients invest time to customize their meeting room, share the guest login link both online and in print media, as well as to share links to files in their Document Center, and Video Postcard presentations. Unlike our competitors, you can protect your business and its revenue stream by having your private label brand source codes archived through a licensed, bonded, 3rd-party Software Escrow agent of your choice. Learn why Software Escrowing is critical to your business. Within just days from now, you can roll-out this highly profitable service under your brand and add significant value to your existing products and services. Pre-load meeting rooms with approved videos, PowerPoint slides, etc. 100% web-based, nothing for Guests to download or install to attend meetings. Lightning fast access for Guests on Windows, Mac and mobile devices. Designed for the non-technical entrepreneur. Simple service equates to few client support requests. “We had been looking for a web meeting private label system for many years in order to facilitate our corporate vision. 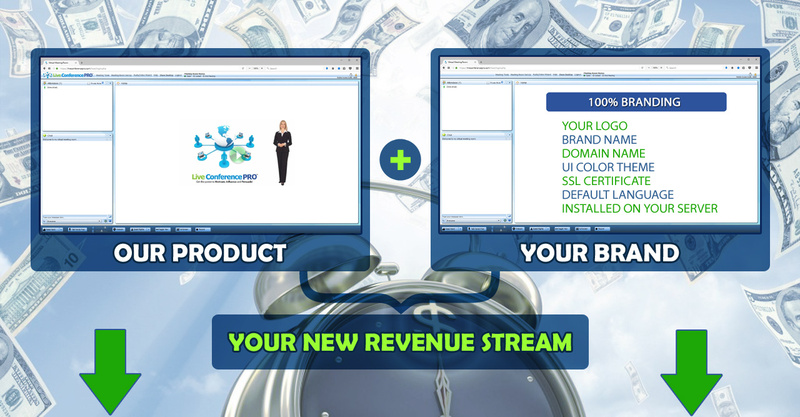 Live Conference Pro’s product has met and exceeded our expectations in this regard. Interactive Multimedia Academy for Global Education, Inc. Learn why our web meeting private label solution greatly minimizes risk to your business.